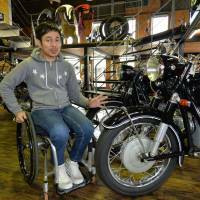 Motorcycle shop owner Ko Sawada, 38, gave up his racing career after incurring a spinal cord injury in a 1999 race. But his love of motorcycles continues, and he hopes to revive the popularity of the vehicles. Sawada runs Motocyclette Sawada with his younger brother, Seiya, 29, selling classic motorcycles. The shop looks almost like a museum, with vintage bikes from Honda, Yamaha and Kawasaki to BMW, Ducati and MV Agusta on display. Most were produced between the 1970s and 1990s. His father, who opened the shop in Shinshiro, Aichi Prefecture, in 1982, inspired him to enter a racing school at the Suzuka Circuit in Suzuka, Mie Prefecture, when he was in junior high school. His elder brother, Rei, who was two years older, joined the school with him and became a professional racer, competing in the All Japan Road Race Championship, the nation’s top racing series. Ko supported him as a mechanic. In 1998, however, his brother died after falling during a race at the Tsukuba Circuit in Shimotsuma, Ibaraki Prefecture. 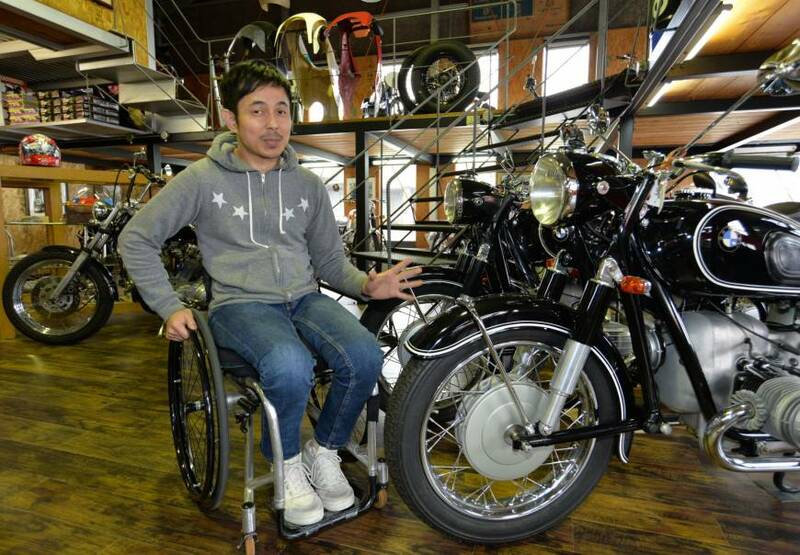 Sawada succeeded him and became a racer himself, but was involved in an accident at the Suzuka Circuit the following year that put him in a wheelchair for life. Sawada said the accident never made him dislike motorcycles. The shop buys classic motorcycles and components through its own channels in Europe and other places. After they arrive, his brother Seiya and the other mechanics take them apart for maintenance and tune them up. When restoring them, they try to retain the original look and feel of the vehicles as much as possible. Sawada mainly manages the sales and accounting operations but performs some of the repair work, too. The shop buys between 60 and 100 motorcycles a year, and sells them to customers nationwide from Hokkaido to Miyako Island in Okinawa. Many of his bikes sell for around ¥2 million. The shop also takes requests to fix bikes that other shops can’t. Sawada, who has worked at the shop for 20 years, said he hopes to promote the attractiveness of motorcycles further. The popularity of motorcycles has been declining in recent years. According to Japan Automobile Manufacturers Association statistics, shipments including minibikes stood at more than 1.21 million between March 1995 and February 1996, but dropped to about 510,000 between March 2008 and February 2009, and then to about 360,000 from March 2015 to February 2016 — a plunge of more than 70 percent in two decades. Experts attribute the change to an increase in car owners, a decline in motorcycle use for daily transport, and the falling birthrate. This section, appearing Tuesdays, features topics and issues from the Chubu region covered by the Chunichi Shimbun. The original article was published May 21.